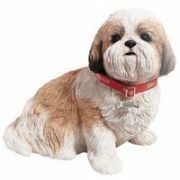 For the best all around pet, you can't go wrong with a Shih Tzu. They are small dogs, maxing out at around fifteen pounds. Our dog is at the larger end of the spectrum. His coat is no less than four different colors: white, black, red, and brown, and he has the cutest expression. Shih Tzus are great pets, they don't need an inordinate amount of exercise and they don't mind apartment style living. They are happiest when they are around people. Our dog loves nothing more than just following us around and taking naps while we go about our business. He was really easy to potty train, but getting him to do tricks took a lot of patience and consistency. These dogs are relatively common, but be sure to check out the references of the breeder that you choose.